Leeds Playhouse’s latest production is a bundle of fizzing fun from start to finish and beautifully put together. People of all ages will love it. Around the World in 80 Days, written by Jules Verne in 1872, must be one of the most popular books that very few 21st century people have read. I haven’t even seen either of the film versions (1956 and 2004), so I had no idea what to expect of a dramatisation except a hot air balloon. In that respect, I was surprised: in every other way, I was delighted by this thrilling show. The basic story is simple. Mr. Phileas Fogg bets £20,000, half his enormous fortune, that he can circumnavigate the world in 80 days. He takes on his trip the rest of the money (in new banknotes) and his servant, Passepartout. Their journey against the clock is packed with extraordinary adventures, not least those caused by mistaken identity. Just before they set out, an enormous sum is stolen from the Bank of England. Detective Fix of the Yard, relying on several coincidences and his ‘sixth sense’, suspects Phileas Fogg: he follows them in hot pursuit right around the world. This stage adaptation by Toby Hulse for a cast of four, tells the rip-roaring yarn brilliantly, firmly with tongue-in-cheek. It makes no attempt at all to be ‘realistic’ but, rather, plays mischievously with the whole idea of theatre and plot. Leeds Playhouse’s production exploits its opportunities to the nth degree. A year of ensemble work has built a confident, inventive team of actors who have helped create this wonderful entertainment with the very talented director, Alexander Ferris. They display enormous talent and versatility, and buzz with infectious energy. The audience enter to the crackling strains of old music hall songs. The stage picture designed by Amanda Stoodley is intriguing from the start. Dominating the space, in the centre, is a large clock face; time is highly significant to this story, of course. There are a few wooden structures to one side and, piled at the back, an armchair, a globe, suitcases and other paraphernalia. It’s when the props and set are used that we see how perfect for purpose they are and how inventive the production. As Phileas Fogg and Passepartout leave London on day one of their journey, they sit in a bath tub. A third character climbs aboard a trunk – and we have a horse and carriage. In India, a wooden slide transforms into an elephant, complete with flapping ears. A hamper becomes… I won’t reveal what the hamper becomes. 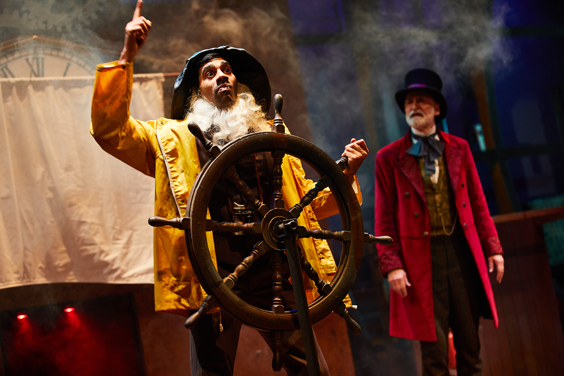 The set and props are also, necessarily, portable: after this run at the Pop-up Theatre, Around the World in 80 Days will tour nine community venues around Leeds. Even in a relatively traditional theatre setting, the show already has a wonderful community feel. Some of the actors mingle with the audience before the play starts. Immediately, we feel included, part of a collective experience. Then, with a rendition of ‘The Man Who Broke the Bank at Monte Carlo’, the fast and furious action begins, using whatever style suits. The relationship between actors and audience, and some of the running gags and stage business are highly reminiscent of Morecambe and Wise. The awesome derring-do set-pieces, brilliantly choreographed by movement director, Jennifer Jackson, have the flavour of silent film stunts. Sound design, by Dom Coyote, marks pace and mood – and highlights the ever-lurking tension of Phileas Fogg’s determined quest to win his wager. The show’s exciting to watch and doesn’t let up for one second. And this production really is hard work – for all the creatives and technicians, including the woman behind the set during the performance who stage manages a array of props, hats and jackets. It’s also a wonderful opportunity for the team to pool their individual expertise, creativity, resourcefulness and wit. What they have achieved is rather special. The actors, on the front line, have to be physically fit, charming and quick-witted as well as enormously imaginative. Vitally, their timing must be impeccable. It is. This foursome clearly relish the theatrical challenge while completely avoiding the temptation to indulge themselves: instead, they share the show with the audience. Even a few fluffed lines and some excruciating character accents are part of the fun. Always, the audience are let into the nuts and bolts of the production – which adds to our pleasure and our appreciation of the actors’ gobsmacking skills. 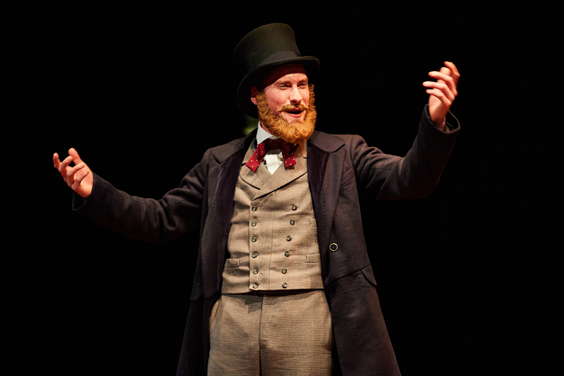 Dan Parr wins sympathy as Jules Verne, desperate that his story be told as he wrote it and that the actors allow him to perform in ‘their’ play. When, eventually, they include him, it’s as an Indian princess rescued from death (still sporting a beard and waxed moustache, of course), but Verne is a poor actor who continually slips out of simpering ‘princess’ mode. Dan Parr’s clarity of performance makes something difficult to describe easy to understand and accept. Both his main roles are well-judged. 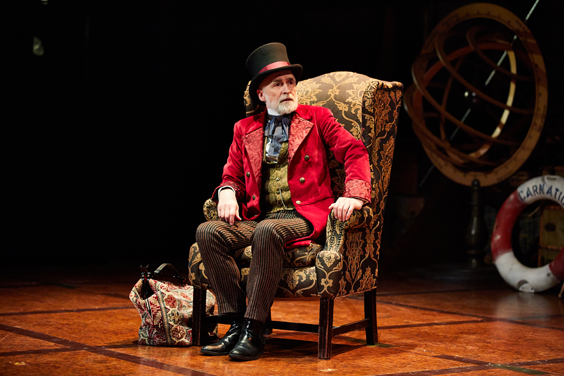 Robert Pickavance has precisely the debonair, correct manner of Phileas Fogg as described to the audience in a quote from Jules Verne’s book. He plays the straight man, an almost unflappable character, with panache. Joe Alessi, whose main character is honest and gullible Passepartout, displays his remarkable comic skills throughout the production, and his uncanny ability to gauge an audience and connect with them. He earns applause after running up and down a ladder and behind the set umpteen times to change jackets, to appear as two different characters in the same scene. Part of the fun is the inventive way one actor covers for another when the impossible is demanded: Darren Kuppan performs a wonderful mime in this scene, complete with a set of funny walks, to give Alessi time for his ridiculously quick change. Kuppan’s main role is Fix of the Yard. Everything the actor does in this production is dazzlingly effective and sometimes breathtaking: his body contorts into miraculous positions, slides across floors, jumps a metre from standstill – and his characters are very, very funny. On top of this, he’s a talented hand-drummer. Whatever the enormity of the actors’ individual talents, it is the collaborative effort of everyone working on Around the World in 80 Days that makes the experience so special. I can’t fault the production. I really can’t. The performance I saw exceeded its running time by 15 minutes, mainly because of spontaneous applause during it. As I write, I’m still aching from smiling continually for more than two hours. 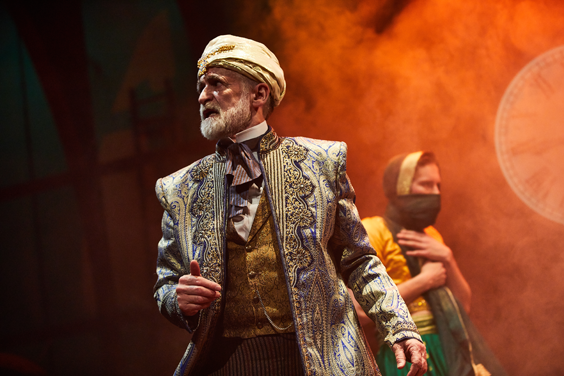 Leeds Playhouse’s Around the World in 80 Days is a wonderful bundle of pure, clean fun. I urge you to look out for it.